I found this dress at a local estate sale. I loved it and have not been able to identify it. "Cissette" Madame Alexander New York USA is what the tag reads. 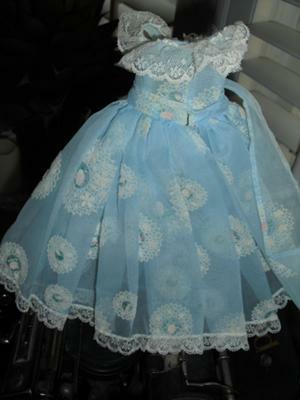 Pale blue with white lace, pink rosebuds, a couple of which have rhinestones in the center. Beautiful dress in perfect condition. If someone could help me identify it please. This dress is pictured on page 16 of "The Glamour of Childhoold Days" (C. Caskill). It is called Blue Lace Floral Cissette Formal by Madame Alexander. Circa 1960. It came on a Cissette Doll. There were two pink rose buds on the left side of the doll's waistband. Join in and write your own page! It's easy to do. How? Simply click here to return to Madame Alexander Dolls.